It is all too easy to become complacent about parasites and our pets. Often, fleas and worms are not easily visible and may only cause subtle symptoms that go largely unnoticed. With busy lives, it can be tough to keep on top of our pets’ prevention all year round and several months can go by before we remember that a parasite treatment was due. For many, wormers and spot-ons are purchased at the time of the annual booster and then neglected for the rest of the year. While taking a relaxed approach to fleas and worms may be the norm, this is something that we need to seriously re-address as to do so is undoubtedly putting our beloved pets at risk. Fleas are one of the most common external parasites we see within Wales. Cats, dogs and even rabbits can become infested with these nasty critters that feed off their blood and make them incredibly itchy. 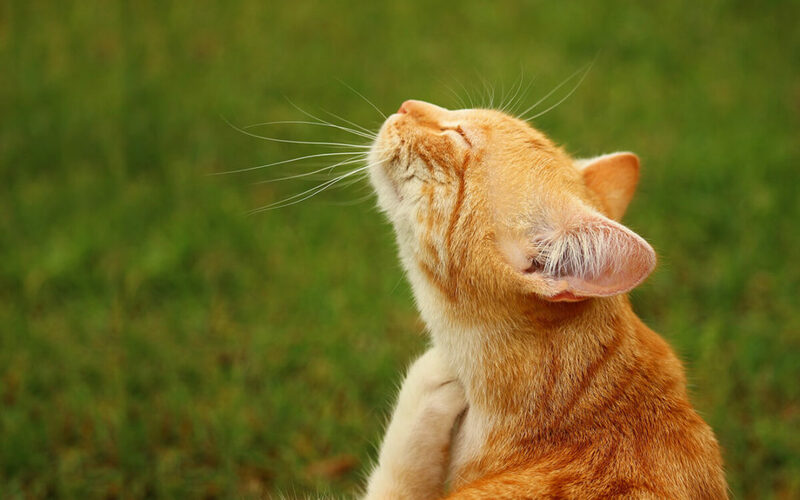 A select number of animals will also have an allergy called ‘Flea Allergic Dermatitis’ which makes them more sensitive to flea saliva and can cause extreme itchiness and skin disease. For these animals in particular, we need to be religious with our flea prevention. To check if your pet has fleas, use a fine comb to brush through their fur, focusing on their back and rump. Comb on to a wet piece of white paper and look for any dark, gritty material. When squished onto the wet paper, any flea droppings will turn a red-brown colour. Their presence tells us that fleas are about. While it is possible to see an adult flea, it is not unusual for an animal to groom them off and eat them before we have a chance. Fleas can even jump onto humans and, while they won’t live on us, can give us some itchy bites too! As well as causing skin irritation (and even skin infections in some cases), fleas are one of the hosts for tapeworm., Thus many animals with a flea infestation will also develop tapeworm at the same time. Treating an active flea infestation is much more work than preventing them in the first place. All cats and dogs will need treatment, as will their environment. Deep cleaning, spraying and hot washing the whole house can be a mammoth task and is just no fun at all. Though many of us associate worms with kittens and puppies, animals of any age can develop worms. Our pets can get worms from one of the following ways 1) fleas, 2) through eating raw or under-cooked meat, 3) ingesting contaminated soil or stools or 4) through hunting mice or birds. It is estimated that around 30% of adult dogs are carrying roundworms at any one time. Some do not exhibit any symptoms, while others may have loose stools, a pot belly, an increased appetite and a dull coat. Worryingly, roundworms can be passed on to people and young children are particularly at risk as infection can result in blindness. Sand boxes (or nature’s biggest kitty litters!) can be a hot bed for worm eggs, which has led to many local councils banning their use. How often a dog should be covered for worms is dependent on their age, lifestyle and the type of worm in question but most will need de-worming every three to six months. Lungworm is a type of parasite that is getting a lot of attention in the media in recent years, and for good reason. Dogs can become infected by eating frogs, slugs, snails or the slime trail they leave behind them. If food or water bowls are left outside, they must be regularly changed to ensure nothing has sneakily crawled inside. A dog with lungworm may be reluctant to exercise, might develop a cough and can have an increased tendency to bleed. Sadly, in an estimated 10% of cases, affected animals will pass away from a lungworm infection. South Wales is a real hotspot for Lungworm and you can check out Bayer’s interactive map to see the prevalence in your postcode: https://mypetandi.bayer.com/uk/lungworm-map. Thankfully, a potentially fatal lungworm infection can be easily avoided through the use of monthly lungworm prevention. As we appreciate not every pet will readily accept their parasite prevention, we stock a wide range of products which include liquid spot-ons, tablets and oral liquid. Our staff are always happy to give you advice on how to administer them and you can book your pet in for a parasite check today.